A patient is brutally murdered in a hospital; the attacker is promptly incinerated when the vehicle blows up in the car park. Witness to a series of bizarre and horrifying incidents, Dr. Dan Challis investigates and comes face to face with the sinister figure of Conal Cochran, maker of Halloween masks. Intent on reviving the rites of All Hallows Eve, a night of ancient sacrifice when, long ago, the hills ran red with the blood of animals and children, the diabolical toymaker is planning a devilish trick or treat for the children of America. Second re-issue on retail from 1989. 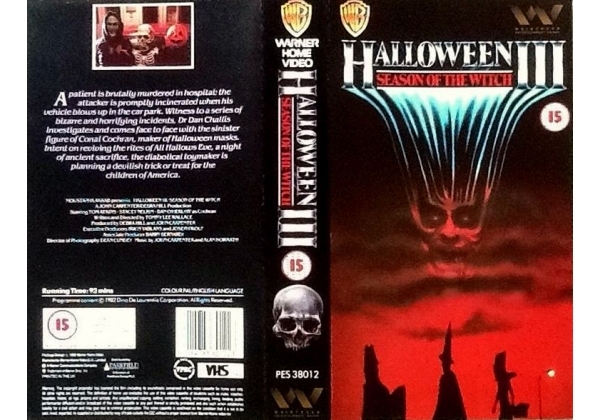 Or find "Halloween III: Season of the Witch" on VHS and DVD / BluRay at Amazon.